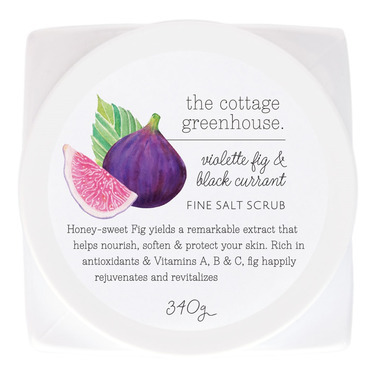 The Cottage Greenhouse's good-for-you, veggie packed, spa-to-go scrub! 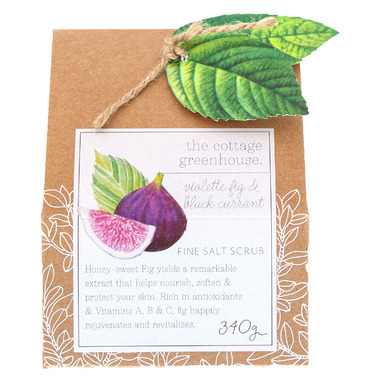 Naturally nourishing Avocado Oil and cheery Carrot Oil (known for its ability to visibly improve skin tone and improve general skin health) blend with luscious Cocoa Butter to create a skin softening sensation! Small granule Sea Salt combined with the polishing power of Adzuki Bean sloughs away sluggish surface cells to reveal your super smooth skin for a happy, radiant glow. Ingredients: Sea Salt, Glycerin, Water, Propanediol, Cetearyl Alcohol, Ceteareth-20, Butyrospermum Parkii (Shea) Butter, Fragrance, Caprylyl Glycol. Passiflora Edulis Seed Powder, Caprylhydroxamic Acid, Aloe Barbadensis Leaf Juice, Honey, Prunus Armeniaca (Apricot) Kernel Oil, Theobroma Cacao (Cocoa) Seed Butter, Ficus Carica (Fig) Fruit/Leaf Extract, Olea Europaea (Olive) Leaf Extract, Vaccinium Corymbosum (Blueberry) Fruit Extract, Vitis Vinifera (Grape) Seed Extract.